Hi! This is HiTech Handymen here! Today we are going to discuss a topic that is important to discuss because we all love our smartphones. We will dispense with the good news first. If you have a recent flagship Samsung Galaxy device, congratulations! The display on recent flagship Galaxy phones are the best in the entire smartphone market due to a technology called OLED. They produce perfectly pitch blacks and vibrant colors, giving your eyes a treat every time you use them. As beautiful as these screens are, they have two shortcomings associated with the technology; cost and display uniformity. Of particular interest right now is the cost of these displays. OLED-type displays are still very expensive to manufacture, even as Samsung have used these types of displays for a long time. While it may be expensive, there's also no other ways to get them as nobody else can replicate the quality of Samsung OLED, of which they often marketed as Super AMOLED©. So, every single third-party repair store resorts to buying expensive OEM Samsung OLED replacement displays for Samsung screen repairs. If things are not bad enough, newer flagship Samsung smartphones have proven to be rather difficult to repair thus limiting the ability of third-party repair stores to offset the price of the replacement parts with cheaper labor. So what you end up with in Samsung screen repairs is an expensive screen and higher labor costs. It's not uncommon for Samsung screen repair prices to cost a few hundred dollars. On the flip side, almost all Apple iPhones use the traditional, back-light LCD displays, so the repair prices for them are much lower. After throwing the acronyms like OLED and LCD at you, here's a quick explanation on these display technologies. In LCDs, there is a white back-light that shines on an unlit substrate of pixels that combine to form colors (color wheel at work here). This produces less rich colors and cannot produce pure black. OLED is basically all those pixels having their own light (yes, every single one). You get black by simply turning off pixels, or producing red by only turning on red pixels. However, do not fret. At HiTech Handymen, we also repair Samsung screens, but at a much more affordable price than larger franchises. 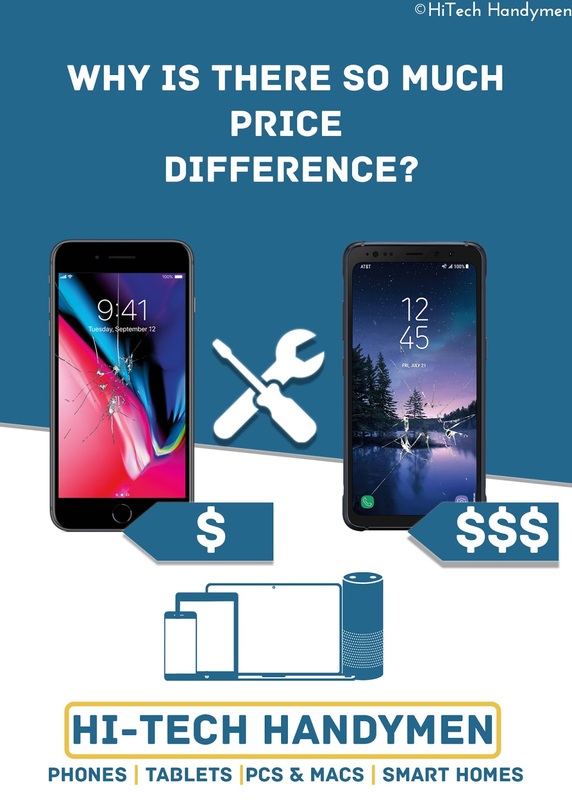 We only charge a very reasonable amount for labor, so you can have your Samsung smartphones repaired at low cost to you! And best of all, our repairs are backed by our 120 days limited warranty so you can feel confident in your repair. Since we don't regularly stock these expensive screens, we do ask that you wait 3-5 business days for the part to arrive so we can repair the device.